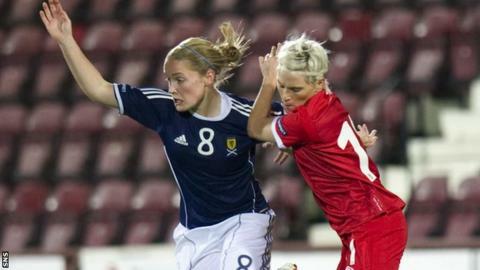 Scotland's Kim Little and Wales' Jess Fishlock are among seven players to re-sign for NWSL side Seattle Reign. Little, 25, was named in the National Women's Soccer League Best XI in both 2014 and 2015. Fellow midfielder Fishlock, 28, has been with the team since 2013 and is one of only two players to be named in the NWSL Best XI three years running. They will return to Seattle in March 2016 for the team's fourth season. Little scored seven goals last season and is the NWSL's all-time leading scorer with 26 goals in 43 games. "Everything about Seattle and the Reign made me want to come back: the city, the club, the people," Little told the club website. "I also feel that for me to keep developing as a player, the NWSL is the best place for me to be next year." Fishlock, who is currently on loan at Melbourne City in Australia, said: "Returning to Reign FC is a great feeling for me. "It's no secret I love this club and I can't wait to return and start a new year." Goalkeeper Haley Kopmeyer, defenders Lauren Barnes, Kendall Fletcher and Elli Reed and midfielder Keelin Winters also re-signed for Seattle, who were NWSL runners-up to Kansas City in 2014 and 2015.